2014, the year we were compiling this issue, was one in which thematising conflict, and its perseverance over time and space, seemed mandatory. While current hostilities raged on and provoked debates about biased media representation and the contested realities they portrayed, as seen in the discussion surrounding the English language media coverage of that summer’s Israel-Gaza conflict, looking at past conflicts became a consuming affair as Europe commemorated the centenary of the First World War. This brought into view an exceptional range of palimpsestic re-imaginings of this historical moment, from Joe Sacco’s magisterial graphic panorama, The Great War, to the restoration and re-issue of films such as Verdun: Looking at History (Verdun, visions d’histoire, Léon Poirier, 1928) and Wooden Crosses (Les Croix de bois, Raymond Bernard, 1932). 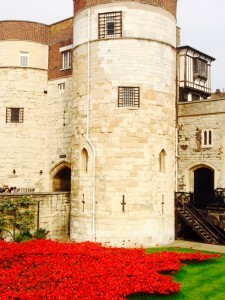 The multi-modal writings and rewritings of the memory of WWI display a remarkable range of cultural investments, which can be mapped along a continuum of contested to consensual memory. Rather than the issue of conflict representation in general, what intrigued us most was the question of how this representation can be conflicting itself in creating and drawing on contested realities. Our choice of the theme “Conflicting Images, Contested Realities” for this issue, while sparked by the discourse in the world around us, was also fortified by our own research. Despite the differences in our areas of study, one of us working on the war film’s cinematic modes of re-territorialising the body, and the other on fantasy representations of trauma, we found that we were continually attracted to the same discussions, questions, and overarching approaches concerning troubling genre or conflict representations and the discussions they provoked. Going beyond the notion of political or military conflict, this issue is about visual media’s inherent confrontational potential. It is interested in the various “conflicting images” of cultural or personal identity that are presented and contextualised both synchronically and diachronically, establishing perspectives on historical, political, social, and individual conditions—images that, by means of their composition or exhibition, conform to a certain ideology, nurture or challenge historical narratives, support and develop iconographies and stereotypes, or deconstruct the very cultural frames from which they emerge. Further the issue explores the contested realities shaped by these images, from national histories to gender to family roles, and how representations of these too generate their own set of conflicting images. With these “re-presentations” exhibiting, in line with the ideas of Jacques Rancière, the ground for both dissent and for social consensus, they become their own politics that is felt and articulated as an aesthetic experience. The questions of the issue then become: If, as Maurice Halbwachs suggests, the past is a social construction reflecting the present, how do contemporary re-imaginings of events such as WWI confront or even contradict past representations? How do these conflicting images and contested realities redefine our perceptions of the past and present as they are negotiated through what Katharine Hodgkin and Susannah Radstonedescribe as a “politics of memory”? This issue thus looks at the insertion of aesthetics into social and political debates and how resulting images and portrayals are produced, distributed, and consumed. In defining the conflicting traits of these re-imaginings, time becomes a decisive factor. Their possible contradictions arise from aesthetic contrasts between past and present representations, different historical contexts, and changing conditions of availability and accessibility. A certain temporal distance is fundamental to practices of commemoration, re-imaginations, and re-interpretations of historical events, or to reflections on personal, life-changing experiences. It enables us to notice the presence or absence of (audio)visual records, such as in Rithy Panh’s The Missing Picture (2013), and highlights the constants and gaps within the aesthetic regime of historical representation. Above all, as time passes and the sites of past conflicts—battlefields, (concentration) camps, ruined cities—change, their every-transforming surfaces can both have us remember and forget what they once knew. Taken one step further, art, especially in form of (moving) images, is thus called on to remember the wounds inflicted on the people and landscapes around us by making and keeping them visible. A recent exhibit that gave reason for pause and reflection in this regard was the Tate Modern’s “Conflict, Time, Photography” (curated by Simon Baker and Shoair Mavlian, November 2014-March 2015). A chronology not of historical events, but of the time succeeding them, it evoked the events while highlighting their absence and exposing their devastating effects. The exhibition looked at images of conflict beyond “the immediacy of reportage”, showing “[t]hat as well as depicting action and incident, photographs can sustain deep reflection on moments in the distant past, their repercussions in the present and even possible alternative projected futures”. To highlight just one piece, Susan Meiselas’ “Reframing History: Nicaragua 25th Anniversary Mural Project” showed the photographer returning to Nicaragua 25 ears after documenting the Sandanista revolution and placing large scale murals of her photos at the sites they had captured 25 years earlier. The past literally set against the present becme a piece of mediation on this historic moment in the nation’s history and how the dreams and images of then aligned or conflicted with the reality of the (then) now. Past and present converge in Pictures from a Revolution (Susan Meiselas, Richard P. Rogers, and Alfred Guzzetti, 1991) in which the photographer retraces her steps and photos of Nicaragua ten years after they had been taken. As seen in Meiselas’ work, several of these historical re-imaginings are brought about by archival images being given a new life through creative re-interpretations. This rebirth can not only be observed in museums and art galleries, but in the cinema as well. Whenever archival footage is employed to historically ground a fictional narrative, to complement different forms of artistic expression used to coming to terms with the past (as demonstrated in Caroline Perret’s article on Derek Jarman’s War Requiem in this issue), or to confront the contemporary viewer with the collective memory of a certain (political) community,the conception of archives as a place of and for the past is being troubled. Instead, the idea of “living archives” as an evolving referential system stimulates and contextualises present historical and political debates, as seen in this issue’s pieces by Natalia Stachura on the new lives of Belgian documentaries and Nathan To’s essay on Tsui Hark’s filmic reproduction of a Chinese Communist utopia. In both narrative and pictorial terms, the constant appropriation and modulation of past representations can be described as what Mikhail Bakhtin calls “genre memory”, the crystallisation of past social experiences into structures that “remember the past, and make their resources available for the present”. As described by Robert Burgoyne and Eileen Rositzka, and also by John Trafton, in their contributions to Frames 7, certain affective figurations in the audiovisual representations of war rely on distinct “pathos formulas” (a term coined by Aby Warburg) that have been perpetually used and re-interpreted within the context of art history, emerging in painting, and re-appearing in both war photography and film. Along these lines, Cilli Pogodda and Danny Gronmaier discuss the war film’s poetics of affect in analysing the interplay of different media aesthetics in Deborah Scranton’s The War Tapes (2006). Inasmuch as archives can be regarded as “living”, performative systems of cultural memory production, the actual geographical sites of conflict are “living landscapes” whose meaning changes over time. Contested during conflicts, belligerent territories serve as sites of different (media) memories and political narratives for disparate parties, as we can see with regard to the Falklands/Malvinas War and its distinctive portrayals in British and Argentine films, illustrated in the articles by Georges Fournier and Mirta Varela in this issue. reading excerpts from Erich Maria Remarque’s 1929 novel, All Quiet on the Western Front. 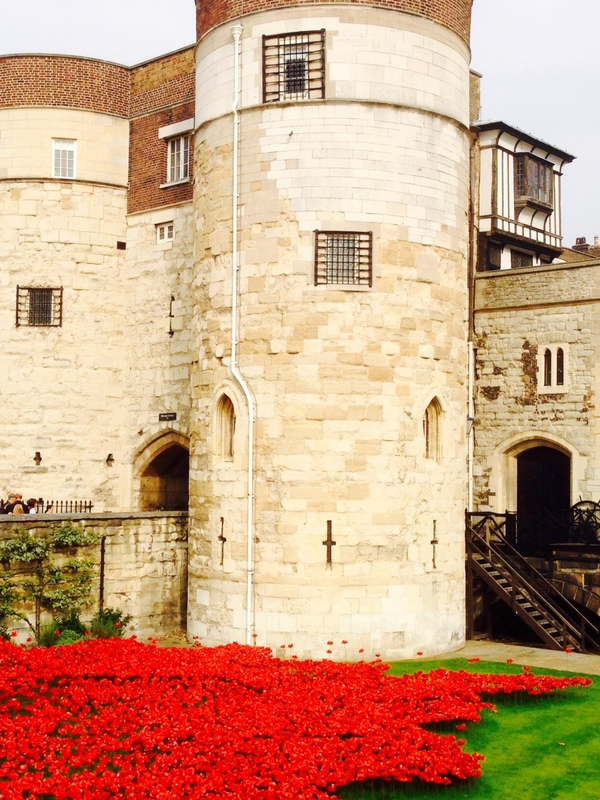 Red poppies spill onto the landscape at the Tower of London. 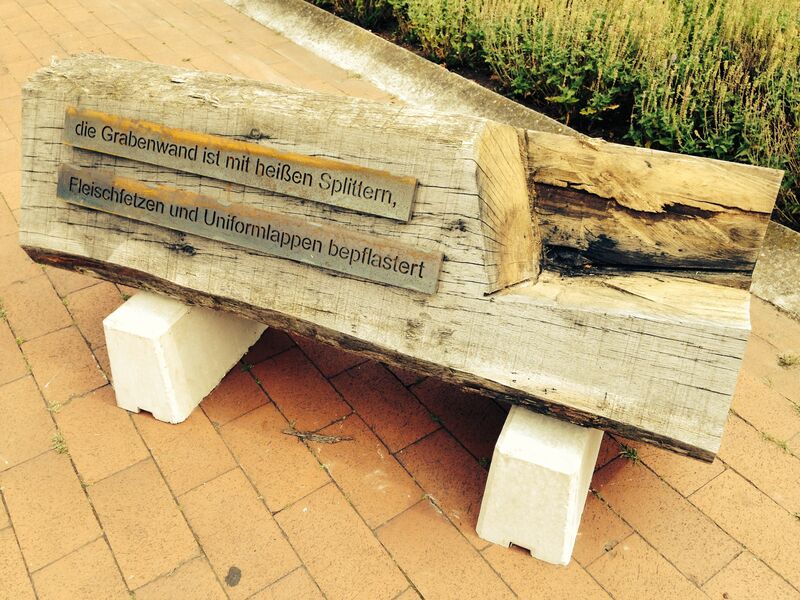 Physical traces of WWI are left in these pieces of wood in Osnabrück, Germany. 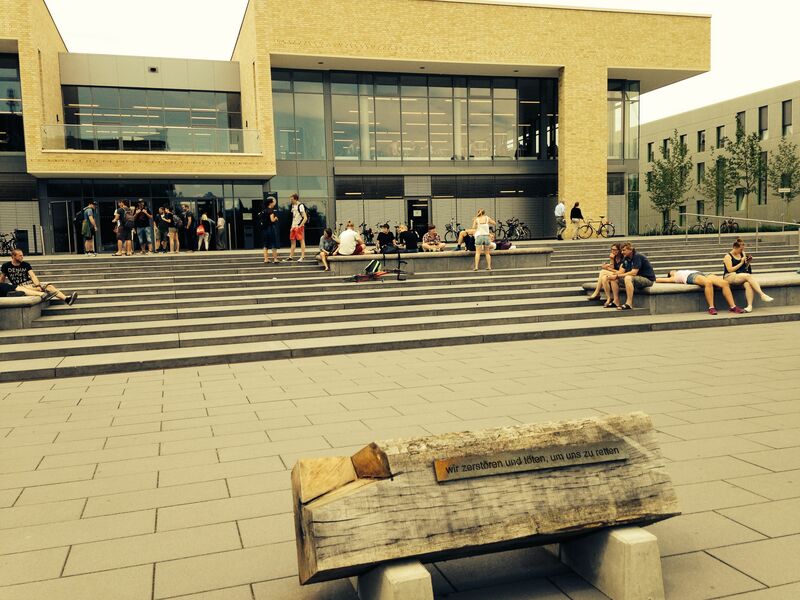 This log has been placed in front of the city’s university building, reading “wir zerstören und töten, um uns zu retten” (“we destroy and kill to save ourselves”). Moving from the contested territorial landscapes of wars and conflicts, another site of contestation becomes the much more personal landscape of the body, conforming to or diverging from politics of gender. While Burgoyne and Rositzka, in their article on war photographer Tim Hetherington, foreground the notion of the male body in war as a “body at risk”, negotiating phantasms of masculinity and vulnerability, Cat Mahoney explores how the lacking agency of women in predominantly male-centred war narratives is challenged by the female TV ensemble drama. As pointed out by Amber Shields in her essay, “Bollywood Bodies”, how and by whom male and female bodies are used as objects of voyeuristic pleasure makes them into a site of gender politics. Taking a more personal, psychoanalytical approach, Diego Costa, in his P.O.V. piece, recounts how the symbolic framing of nationality, class and gender shaped his identity and self-conception, which informed his film, Matricídio (featured in this issue). The personal, to come full circle back to the idea of time as one of the greatest sources of conflicting images of a contested reality, also comes to play in the creation of generational memories. As described in Marianne Hirsch’s influential concept of “postmemory”,the deeply personal sharing of memories within the family leads to new images and memories of traumatic events. These memories, however, also take on a life beyond the immediate personal of the family as they become re-imagined by different generations who have no personal ties to an event. According to James Young’s idea of a “vicarious past”, they represent an “after-image”, which is exemplified in Victoria Grace Walden’s article on new Holocaust representations by younger generations in this issue. Thus while many of the articles included in this issues address conflicts with military involvement, from the Great War to WWII to the Civil War to the Iraq and Afghanistan Wars, what is at the heart of these discussions of conflict is the set of conflicting images they produce and refer to as well as the topical diversity of conflicting and contested representations beyond war. In terms of methodology, all contributions present different ways of approaching this theme, ranging from forms of self-exploration through media to analytical work on aesthetic codes and cultural practices. In a Benjaminian sense, these works treat individual, cultural and media memory not as an “instrument for exploring the past but its theater”, a “medium of past experience”. As this memory is constantly re-shaped and re-contextualised, what needs to be unravelled is its core: the discontinuous images provoking this associative transformation. If, in the words of Walter Benjamin, “history breaks down into images not stories”, this issue of Frames breaks down the stories of contested realities into the conflicting images creating them. Jacques Rancière, The Politics of Aesthetics: The Distribution of the Sensible (London: Continuum, 2004). Maurice Halbwachs, On Collective Memory, trans. Lewis A. Coser (Chicago: University of Chicago Press, 1992). Katharine Hodgkin and Susannah Radstone, Contested Pasts: The Politics of Memory (New York: Routledge, 2003). Chris Dercon, “Afterword,” in Conflict/Time/Photography [exh. cat. ], edited by Simon Baker and Shoair Mavlian (London: Tate Publishing, 2014), 230. These reflections were to an extent capture in the accompanying film project Reframing History (Susan Meiselas and Alfred Guzzetti, 2006) that interviewed Nicaraguans on this installation. The idea of new encounters with archives is a running theme in Meiselas’ work, as exhibited in her projects Encounters with the Dani (New York: Steidl/International Center of Photography, 2003) and her Kurdistan projects including the book Kurdistan in the Shadow of History (New York: Random House, 1997) and the living archive of the website akaKurdistan. For more on Meiselas’ archival projects and other work see her website: http://www.susanmeiselas.com/ . See Gary Saul Morson and Caryl Emerson, Mikhail Bakhtin: Creation of a Prosaics (Stanford: Stanford University Press, 1990). Marianne Hirsch, The Generation of Postmemory: Writing and Visual Culture after the Holocaust, (New York: Columbia University Press, 2012). James Young, At Memory’s Edge: After-Images of the Holocaust in Contemporary Art and Architecture (New Haven: Yale University Press, 2000). See Walter Benjamin, “A Berlin Chronicle,”in Selected Writings, Vol. II: 1927-1934, translated by Rodney Livingstone, edited by Howard Eiland and Gary Smith (Cambridge, MA: Belknap Press, 1999), 603-615. Walter Benjamin, quoted in Gerhard Richter, Walter Benjamin and the Corpus of Autobiography (Toronto: Scholarly Book Services, 2002), 199. Benjamin, Walter. “A Berlin Chronicle”. In Selected Writings, Vol. II: 1927-1934, translated by Rodney Livingstone, edited by Howard Eiland and Gary Smith. 603-615. Cambridge, MA: Belknap Press, 1999. Dercon, Chris. “Afterword.” In Conflict/Time/Photography [exh. cat. ], edited by Simon Baker and Shoair Mavlian, 230-231. London: Tate Publishing, 2014. Emerson, Caryl and Gary Saul Morson. Mikhail Bakhtin: Creation of a Prosaics. Stanford: Stanford University Press, 1990. Halbwachs, Maurice. On Collective Memory, translated by Lewis A. Coser. Chicago: University of Chicago Press, 1992. Hirsch, Marianne. The Generation of Postmemory: Writing and Visual Culture after the Holocaust. New York: Columbia University Press, 2012. Hodgkin, Katharine and Susannah Radstone. 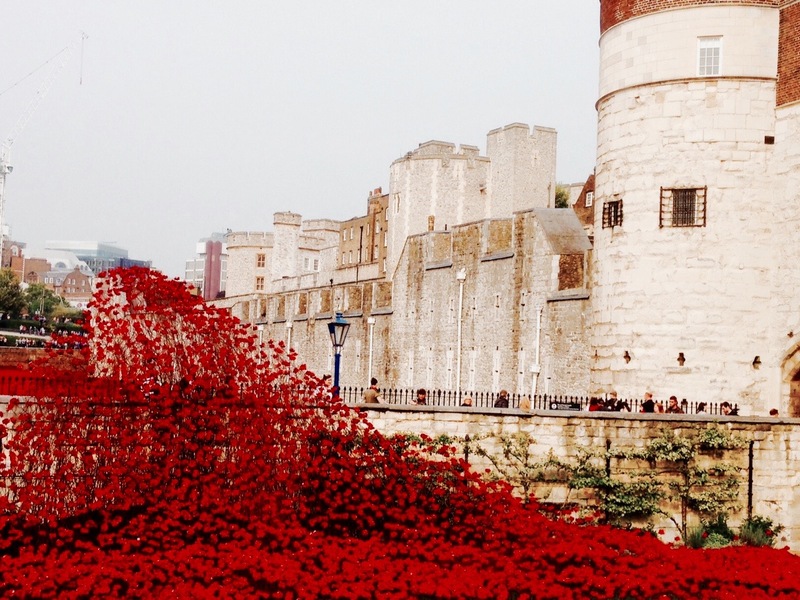 Contested Pasts: The Politics of Memory. New York: Routledge, 2003. Meiselas, Susan. Encounters with the Dani. New York: Steidl/International Center of Photography, 2003. —- Kurdistan in the Shadow of History. New York: Random House, 1997. Rancière, Jacques. The Politics of Aesthetics: The Distribution of the Sensible. London: Continuum, 2004. Richter, Gerhard. Walter Benjamin and the Corpus of Autobiography. Toronto: Scholarly Book Services, 2002. Sacco, Joe. The Great War. London: Jonathan Cape, 2013. Young, James. At Memory’s Edge: After-Images of the Holocaust in Contemporary Art and Architecture. New Haven: Yale University Press, 2000. The Missing Picture (Rithy Panh, 2013). Pictures from a Revolution (Susan Meiselas, Richard P. Rogers, and Alfred Guzzetti, 1991). Verdun: Looking at History (Verdun, visions d’histoire, Léon Poirier, 1928). War Requiem (Derek Jarman, 1989). Wooden Crosses (Les Croix de bois, Raymond Bernard, 1932).